Three men were arrested in Lyndhurst, New Jersey, for their alleged mortgage fraud scheme. 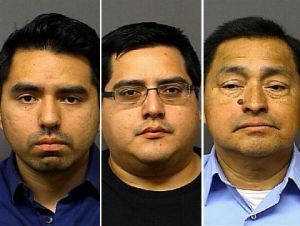 Adam Cueva, Adan L. Cueva, and Angel C. Cueva-Castro are all accused of trying to defraud homeowners. For months, their Time Consulting & Associates firm has been collecting mortgage payments from homeowners for months. The accused conmen charged fees up to $5,000 and were able to acquire personal and financial information from their victims. They then encouraged homeowners to stop making mortgage payments and allow Time Consulting & Associates to handle the situation. However, the payments that they collected were never forwarded to the creditors as promised. The scheme was revealed when banks then placed loans in default. Aside from mortgage fraud, the conmen are also accused of using personal information to open fraudulent credit card accounts. When customers contacted Time Consulting & Associates with complaints, the schemers allegedly sent fraudulent letters pretending to be the banks to assure customers that everything was all right. The mortgage fraud scheme affected residents of Lyndhurst, New Jersey and the greater area. The men are charged with trafficking personal identification information, mortgage fraud, and theft by deception. Unfortunately, mortgage fraud cases aren’t limited to only states like New Jersey. Mortgage fraud can happen anywhere as predators prey on those struggling with mortgage debt. While debt can cause stress and emotional and financial hardship, it’s important to stay rational and reasonable to avoid falling for a mortgage fraud scheme. While all three men are in jail, held on a $500,000 bond, there are many scammers still trying to take advantage of the anemic economy. If you’re struggling with your mortgage debt, consider, meeting with a foreclosure attorney to discuss all of your options with someone you can trust.